Commercial butter is 8082 percent milk fat, 1617 percent water, and 12 percent milk solids other than fat (sometimes referred to as curd). It may contain salt , added directly to the butter in concentrations of 1 to 2 percent. Unsalted butter is often referred to as sweet butter. This should not be confused with sweet cream butter, which may or may not be salted. Reduced-fat, or light, butter usually contains about 40 percent milk fat. Butter also contains protein, calcium and phosphorous (about 1.2%) and fat-soluble vitamins A, D and E.
Although there are over 120 different compounds that contribute to butters unique flavor, the five primary factors responsible for butters flavor include: fatty acids, lactones, methyl ketones, diacetyl and dimethyl sulfide. Read more about the composition. Chemically butter fat consists essentially of a mixture of triglycerides, particularly those derived from fatty acids, such as palmitic, oleic, myristic, and stearic acids. 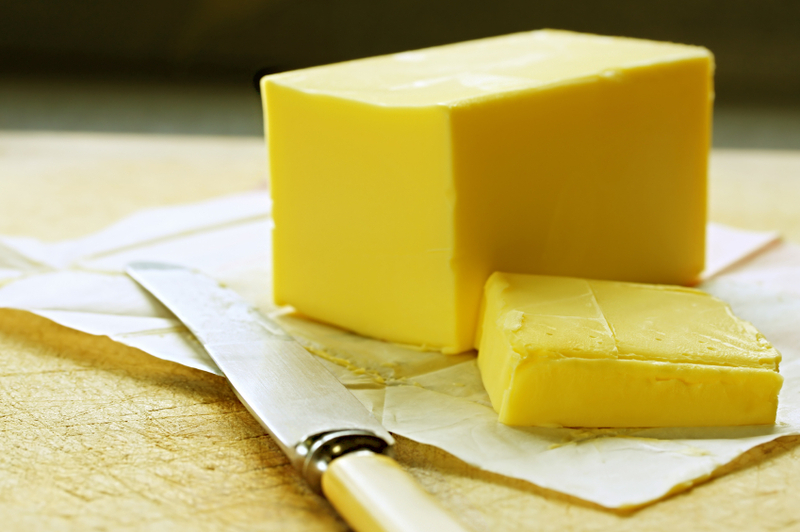 The fatty acid composition of butter fat varies according to the producing animal's diet. A measure of the amount of these acids, the Reichert-Meissl, or Reichert-Wollny, number is important in the analysis of butter fat.